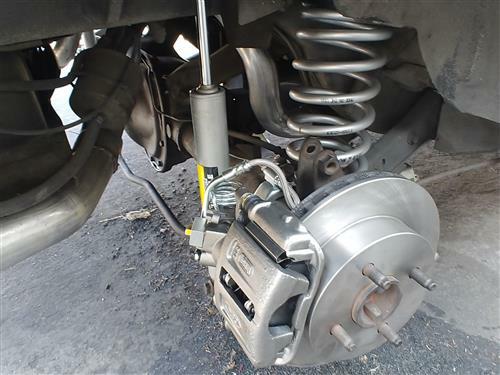 Improve the braking performance by getting rid of your drum brakes using this 1979-1986 Mustang rear disc brake conversion! 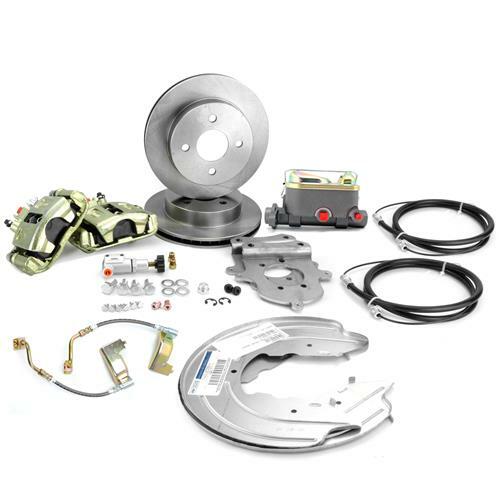 Ditch the drum brakes on your 1979-1986 Mustang with this 5.0 Resto 4-lug disc brake conversion! 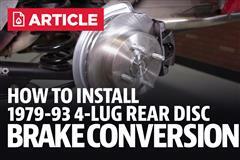 This is the most complete 4-lug disc brake conversion you'll find on the market! This is a great conversion for someone that wants to retain their 4 lug wheels but upgrade to rear disc brakes. It has everything you need including the dust shields, proportioning valve, lines, calipers, pads, brake lines, E-brake cables, rotors and hardware. The factory 4-lug axles are retained for an easy installation. The brake calipers included with this kit are the 93 Cobra/87-88 Thunderbird Turbo Coupe rear calipers. These calipers are completely disassembled, thoroughly cleaned, inspected, and then reassembled using only the highest quality materials. These calipers come with the correct brake pads so there's no hunting the parts stores for the correct pads! New drum to disc brake conversion hard lines are included! Rear caliper pistons may need to be adjusted/compressed before installation. 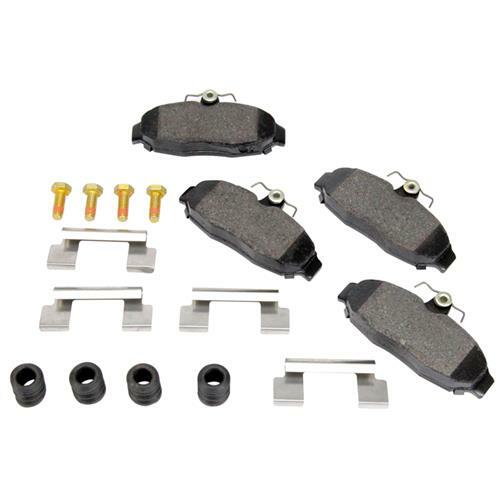 This kit includes an SVO master cylinder to provide the appropriate fluid pressure to the rear brakes. This master cylinder bolts directly to your existing lines with no adapter needed. 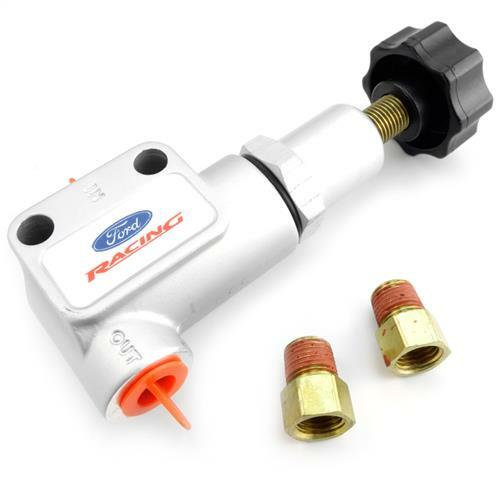 Included with the master cylinder is the Ford Performance adjustable proportioning valve and 5.0 Resto block off plug to correctly provide brake fluid pressure to the rear calipers. 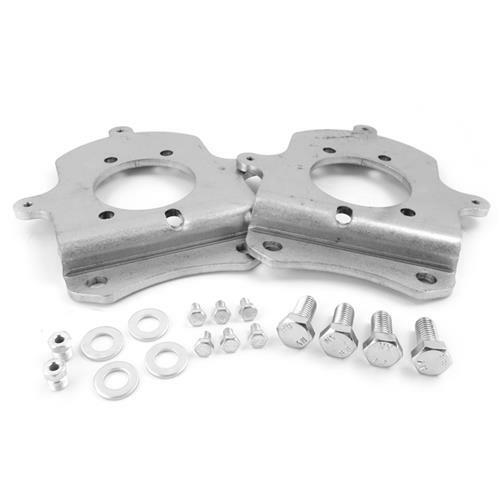 A pair of Maximum Motorsports adapter fittings are included to connect your hardlines with. These may or may not be used depending on your application. 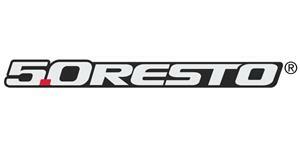 We include a set of disc brake parking cables that are a direct replacement for the stock drum brake cables. These cables connect to the body and the calipers with no modification. The correct e-clips are included to retain them to the caliper! 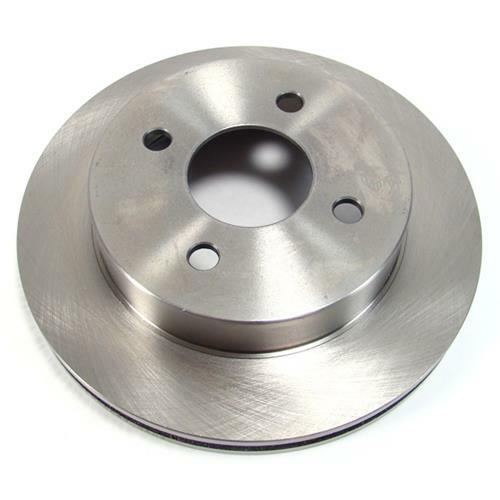 Because of several variables pertaining to the rear end and axles, the brake dust shields may need to be mounted on the backside of the caliper adapter bracket or not used. When mounting the dust shields to the back of the bracket, install the retaining hardware from the backside and grind off any exposed thread. 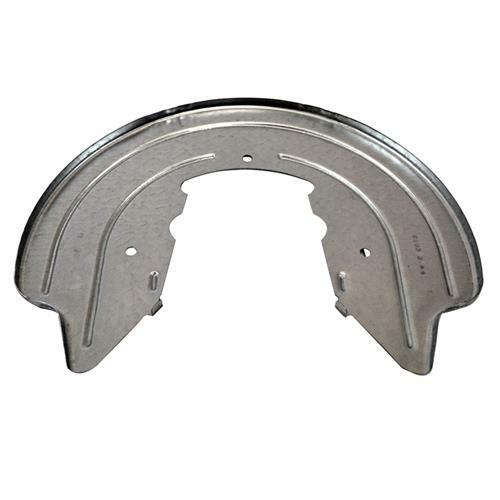 The 1986-1998 Mustang 8.8" housing is not perfect and it will be necessary to remove a small amount of material from the rear upper corner of the housing flange. This will allow the new bracket to be rotated into position for the bolt holes to line up. 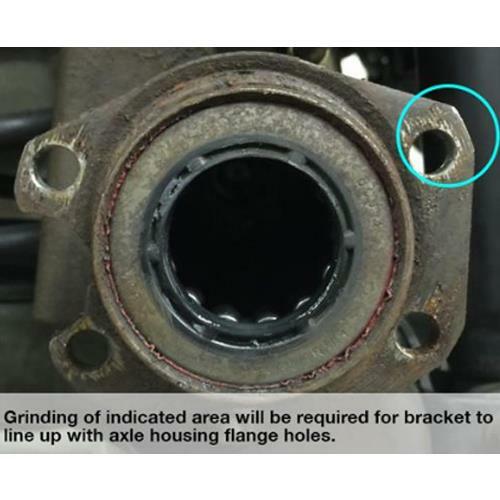 See the above product image of the driver side flange for the exact location the grinding is needed.